Another active England pacer Stuart Broad has 79 wickets to his name at Lord’s as well. 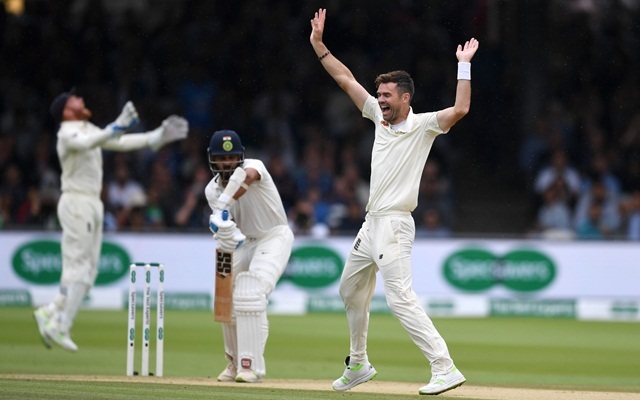 James Anderson continued his impressive bowling in the Lord’s Test match against India where he dismissed the Indian openers in both the innings of the game. The Englishman bagged a five-wicket in the first innings playing a crucial role in bundling out the visitors to just 107. Anderson perfectly utilized the overcast conditions and the movement on offer from the pitch. In this process, he completed 350 wickets at home in Test cricket and now stands only behind Muttiah Muralitharan on the list of players with most home Test wickets. The right-arm pacer dismissed Murali Vijay for the 2nd time in the Test for a duck and went on the scalp KL Rahul as well before a rain interruption. With the wicket of Vijay, Anderson completed 550 wickets in Test cricket to become the 5th player and only the 2nd pace bowler after Glenn McGrath to take as many wickets. Vijay’s dismissal was also Anderson’s 100th Test wicket at Lord’s. Thus, he became only the 2nd bowler and the first pacer to claim 100 wickets in Test cricket at a venue. The legendary Sri Lankan off-spinner Muttiah Muralitharan claimed over 100 wickets at three different home venues in the longer format. He bagged 166 wickets at the Sinhalese Sports Club Ground in Colombo; the most for any player at a venue. 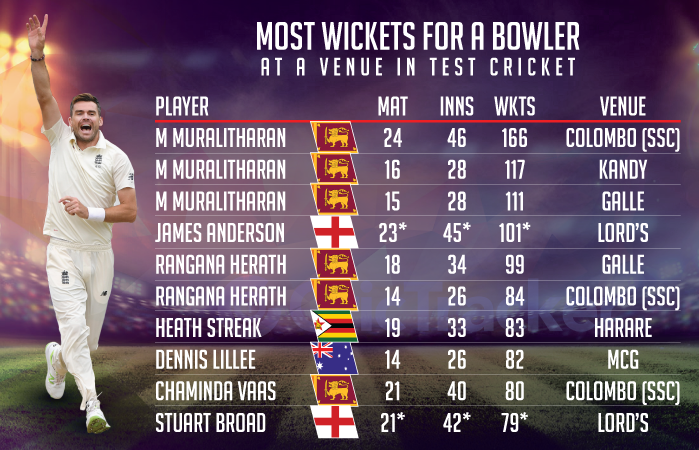 Rangana Herath is soon to join the list having taken 99 wickets in 5-day cricket at the Galle Stadium. The left-arm spinner also had 84 wickets to his name at the SSC in Colombo. Zimbabwe’s Heath Streak had 83 wickets at the Harare Sports Club in Test cricket are the 2nd most by a pacer at a venue. Dennis Lille and Chaminda Vaas have accounted for 82 and 80 wickets respectively at Melbourne Cricket Ground and SSC in Colombo. Another active England pacer Stuart Broad has 79 wickets to his name at Lord’s as well.